aerial wrote: Not really planning on writing such guide, it is quite a lot of work. I've been enjoying more to make untwinked chars to work, rather than play with endgame stuff recently. Fastest fastest barb would be one with samael sword, and just harbinger. 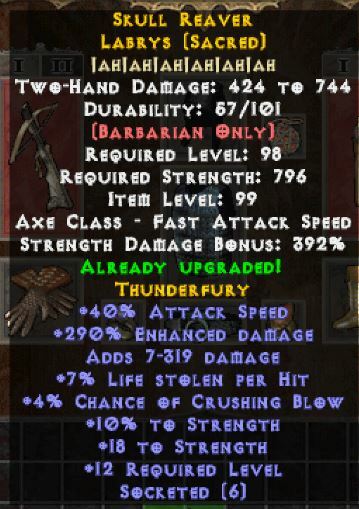 What would be the best place to farm marchosias might + hatred, warmonger and the SU labrys? 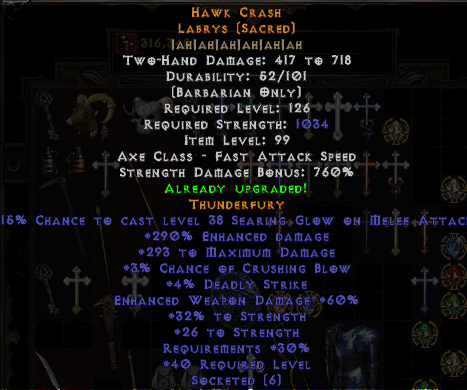 Duncraig is the best for sacred uniques, for sets probably k3ba is better. But is gonna be very difficult to "target farm" specific items. - dropped Candlewake: woohoo , i'll take it! 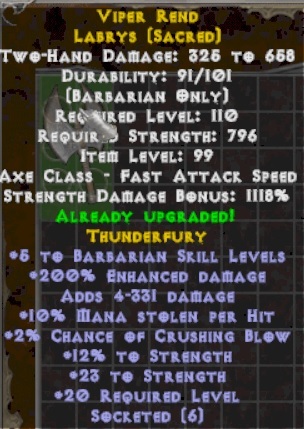 Crafted a couple weps and need some input please. I know they dont have a WDM kill proc, but this is what I could come up with so far. Need a lil insight if the plus skills would be better to use and if so why or why not? Are these decent crafts for this build? 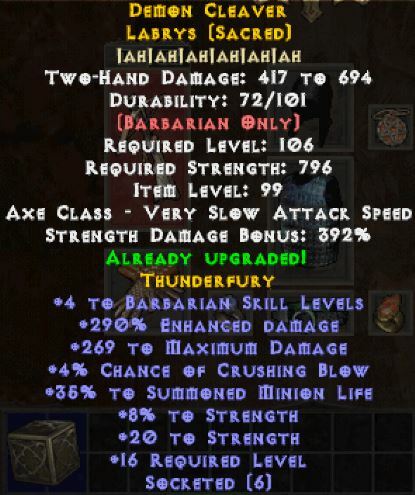 Yeah, I think I'd go with 4 barb skill ones as the damage is very close on them. today i made this, searing glow is be worth? Is this axe better than an labrys su? Does Deathgaze attack seem slower for some reason? Anyone else have this problem?